Word is going around on Twitter this morning that Amazon has released a new version of the Kindle app for the iPad. According to the changelog this update doesn't add any major technical improvements or new features, but it does add several subtle improvements which finicky readers will appreciate. I don't have my iPad with me in NYC so I can't confirm it (I'm trying to get screenshots and first-hand reports), but Amazon says that the update improves page layout and adds hyphenation and better kerning, or as they put it, the app offers "smoother word spacing". I can't wait to see this, myself. As a rule, the Kindle platform didn't offer hyphenation and it defaulted to full justification, and that made the ebooks look ugly. If Amazon fixed this then the ebooks in the iOS app are going to be a whole lot prettier than they used to be. They should also prove easier to read. Update: Or perhaps not. Amazon pointed me to a new page on its website which explained that the new features (dropcaps, better kerning, hyphenation) are not available to all ebooks on the Kindle platform. Several people on Twitter have confirmed that detail (example at right). The kerning is still terrible on most ebooks, and few ebooks have hyphens (one, two, three, four). Amazon also reports that they've added their Bookerly font to the iOS app. Released earlier this year on the Kindle apps for Fire tablets, Bookerly was developed for the Kindle apps by Monotype. It's designed to be easy to read on LCD screens and look great at all font sizes. As Steve Matteson explained in the video I posted last week, that is harder than it sounds. In order to get the best performance, fonts need to be customized for specific screen types (LCD vs E-ink), and getting a font to look good at the largest size as well as the smallest size requires subtle tricks. 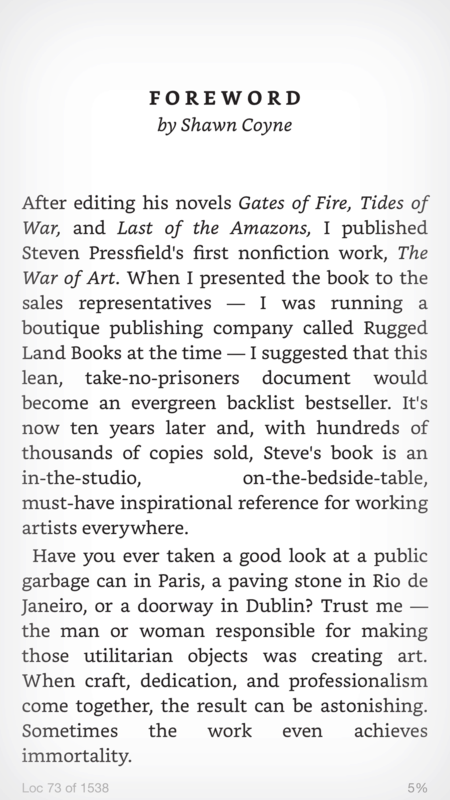 This is why Amazon has a font (Bookerly) just for its Kindle apps, and uses other fonts on its Kindle ereaders. Edit: Choice is also good; Amazon just told me that the Bookerly font will be made available on Kindle ereaders later this year. The app can be found in iTunes. Twitter in Talks to Acquire Flipboard, Perhaps Host News Articles? I realized I haven’t read on my iPhone 6 (and sold off my iPad) – I have stuck to just using my Kindle Paperwhite. But checking it out I thought that the pages look better than anything I ever remember from the app. I updated my iPad Kindle app, after getting really excited about the promised improved kerning, hyphenation and larger font display. Well, as you pointed out (and thank you for the link to the updated books), existing books neeed to be upgraded to take advantage of the layout improvements. Fair enough. I downloaded a sample from one of those updated books – and it looked good enough, from what I could tell. However, I really, really personally dislike the new Bookerly font. It renders as a very thick font on my iPad Air 2 and I still prefer – by far – the Palatino font. I just couldn’t read books well enough with the Bookerly font – but I’ll give it another try and a longer try. Palatino has enough white space to make it more legible to my eyes. I really don’t like heavier Times Roman-style fonts for book reading. But that’s a very personal preference – and many of you may totally disagree with me, which is why there are thousands of fonts out there. Also, the font files of the typeface is named BookerlyLCD_Rg.ttf and such, I infer that an eink version is also coming. That is great. Individual books from the Amazon have to be updated by Amazon to be able to use the new text-rendering engine. I would expect that Amazon is going to make one camp unhappy. If they wanted to make everyone happy then the settings would already be user adjustable. As for me, I prefer a ragged right. But if Amazon can work on the kerning and hyphenation then I’d be happy with full just. Could you please test side-loaded books when you get home? There is nothing about sideloaded books in all those articles and blogs that talk (and copy from each other) about the new rendering engine and a new font. I will check, but I’m not expecting to have any success. While we’re on the topic, one tweet I found mentioned that sideloaded KF8 fixed layout still didn’t work. On iOS devices? Amazon fixed this a while back. Open the mobi file in Kindle Previewer and select iOS from the Devices menu. This converts the book to the azk file format which can be sideloaded and played on iOS devices. Thanks. Maybe I misread the tweet. The ebooks which I uploaded to the Kindle Cloud and then downloaded again (after the update) do not show the new formatting. No, wait, at least two of the titles on that page don’t have hyphens or the improved kerning. I’m staring at one right now.